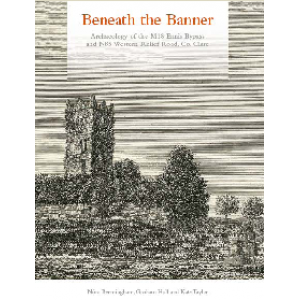 Beneath the Banner describes 28 archaeological excavations along the route of the M18 Ennis Bypass and N85 Western Relief Road, Co. Clare. The results amount to a timeline investigation of human settlement and landscape change in the Fergus River valley, in central Clare, from early prehistory to modern times. Cremation cemeteries of Bronze Age to Iron Age date at Manusmore occupied elevated locations that seem to have had a special relationship with the Fergus estuary. Cahircalla More is a very rare example of an early medieval ringfort that was occupied by a blacksmith and his forge. At medieval Clare Abbey, excavations for a parking area recovered important objects relating to its history as an Augustinian Abbey and, afterwards, a post?Reformation secular household. The investigations were not confined to prehistoric and medieval times, but also lovingly recorded the fieldwalls, trackways, houses and limekilns of a rapidly vanishing early modern landscape. 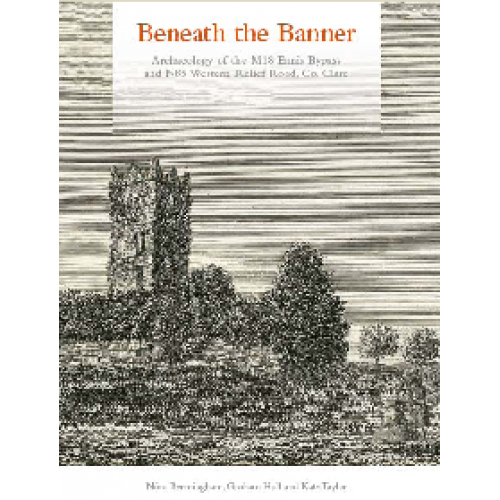 Accompanying the account of all these discoveries is a series of short scholarly essays that explains their significance in the story of changing human communities in the central Clare lowlands over time. The book is lavishly illustrated and written in an easy, narrative style. Paperback, 190 mm x 245 mm; 200 pages; maps, line drawings, photos; full colour.